Pre-coated GRP (Glassfibre Reinforced Plastics) also known as Fibreglass – very strong, yet lightweight. It is often used in the construction of boats and racing cars. GRP can be finished in anything from gloss to the texture of cast iron, stone or grained wood. PVC (Polyvinyl chloride) is a hugely popular choice in the building and construction industry replacing many traditional materials such as wood and metal. It is strong yet lightweight, easy to install and is resistant to weathering, chemical rotting, corrosion, shock and abrasion. Steel Roller Doors – is favoured by many because of its durability. Garage doors constructed of steel require very little maintenance and will last for years. Steel doors are available in a range of designs and colours. 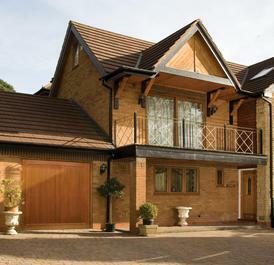 Timber Garage Doors – a traditional material for garage doors, timber is still very popular particularly for homeowners looking for a natural material. It does not crack or dent and can be treated to prolong its life. In addition, timber can be repainted regularly to maintain, or change, its appearance. Not sure what to choose for your home? Why not give us a call for a chat on 01992 630 404, or pop into our Cheshunt Showroom, we’d be happy to advise you on choosing the appropriate Garage door finishes.